The crew hoisted the tricolour as they raced towards Port Stanley in the Falkland Islands. Defence Minister Nirmala Sitharaman had flagged off the 56-foot vessel from Goa on September 10. PM Modi congratulated them and said was "proud of their accomplishments." It was termed as "historic" when an all-woman Indian Navy team set sail for one of the toughest feats -- a global circumnavigation trip - in September last year. 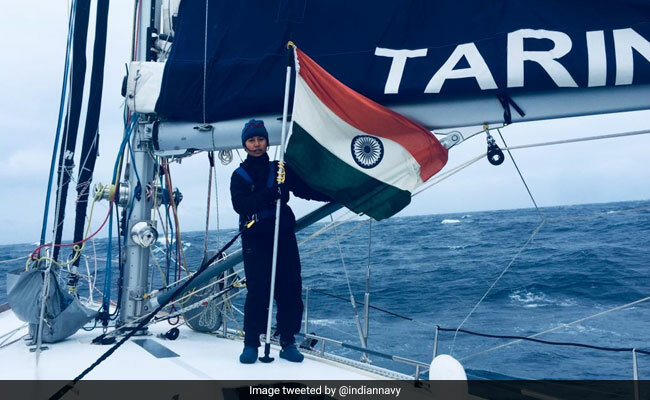 And now the six-member crew of the tiny sailboat Indian Naval Sailing Vessel (INSV) Tarini has successfully crossed the notoriously rough Drake Passage, as they rounded Cape Horn off the Southern tip of South America, sometimes called the Mount Everest of sailing. They hoisted the tricolour as they raced towards Port Stanley in the Falkland Islands. Prime Minister Narendra Modi congratulated the crew and said he was "proud of their accomplishments". Defence Minister Nirmala Sitharaman had flagged off the 56-foot vessel from Goa on September 10. The indigenously-built INSV Tarini reached Lyttelton in New Zealand early last month after their first stop in Australia. The crew's four stop-over points include, Fremantle in Australia, Lyttelton, Port Stanley and Cape Town. The five-leg expedition is titled 'Navika Sagar Parikrama'. Led by Lieutenant Commander Vartika Joshi, the five-leg expedition is titled 'Navika Sagar Parikrama'. The leg between Lyttleton and Port Stanley in the Falkland Islands off Argentina in the Atlantic Ocean may well be their toughest. They are slated to return to Goa in April. The expedition aims to showcase 'nari shakti' on the world platform and increase their participation in the challenging environment. During their journey, the officers are also collating meteorological, ocean and wave data and monitored marine pollution besides putting together piping hot vadas. The first Indian solo circumnavigation was undertaken by Commander Dilip Donde, SC (Retd) from August 19, 2009 to May 19, 2010 on board another India-built vessel INSV Mhadei. It was later used by Lt Commander Abhilash Tomy for his own single-handed, unassisted, non-stop circumnavigation from November 1, 2012 to March 31, 2013.